Do You Think We Eat Enough Cereal In My Household? My family is a big consumer of cereals, and the top of our refrigerator proudly displays a grocery aisle full of cereal boxes at any given time. My explanation for this is simple: my kids get hungry and want a quick meal! Not only is cereal super-fast to prepare, but a bowl of cereal and milk can be a good source of nutrition. I'm very careful to read the ingredient list of any box of cereal that I bring into our household. 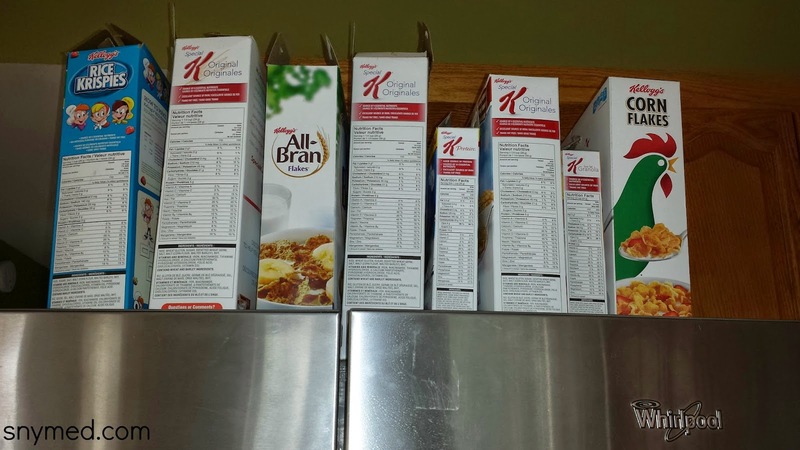 Kellogg's Corn Flakes, Rice Krispies, and Special K are all staples in my kitchen. As an adult, I often enjoy a bowl of cereal when I'm in a rush and want something filling. Before the "cereal diet" was ever created, I could regularly been seen munching on cereal for meals other than breakfast. I guess that my kids picked up this same habit, and will eat it whenever hunger hits. 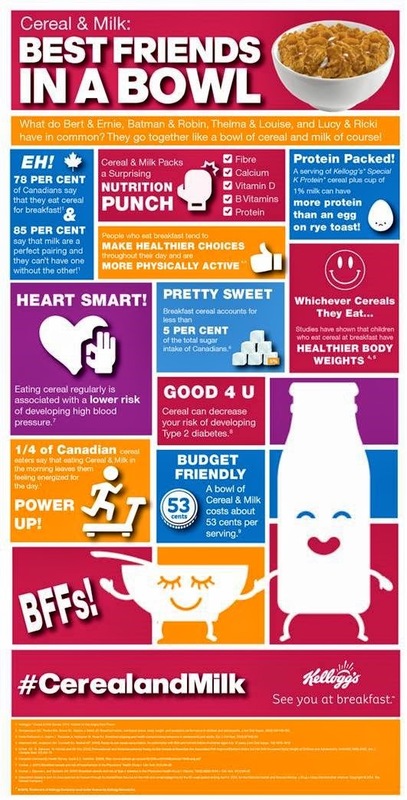 Curious about the nutrition behind a bowl of cereal and milk? 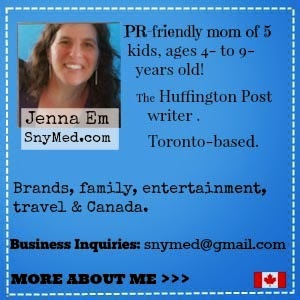 Check out the cute infographic, below. Or, check out the Kellogg's cereal and milk website, HERE. Leave a COMMENT below stating your favourite Kellogg's cereal OR if you enjoy cereal and milk--and when. Then use the entry form below to enter the contest. GOOD LUCK! LOVE Fruit Loops and milk! I quite like the Special K line of cereals. My favourite Kelloggs' cereal is frosted flakes. My favorite Kellogg's cereal is Mini Wheats with brown sugar. 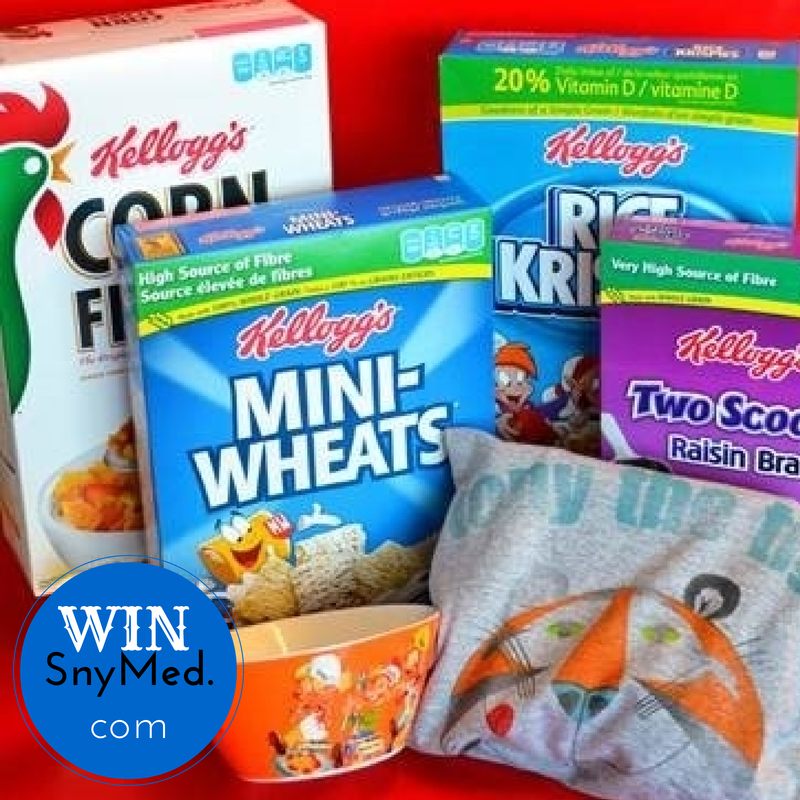 I would love to win this awesome cereal contest.I love Kellogg's!! I would brown sugar mini wheats. I love milk and cereal at night for a snack. I love Kellogg's Rice Krispies! Snap, Crackle and Pop! I love Rice Krispies the most! I love Kellogg's Raisin Bran mixed with a few mini wheats and milk for breakfast, but the odd time at night. Grew up on Corn Flakes! Rice krispies is my favorite. I like Special K especially with milk. It is my absolutely favourite cereal. Mini-Wheats have been part of my life for as long as I can remember! With milk of course! mmmmm i love rice krispies! My favourite Kellogg's cereal is Raisin Bran. My favorite cereal is corn pops. ate rice krispies every since I was a child and still love them,sometimes when I am not to hungry I will have a bowl for dinner or sometimes even after dinner,i will have a bowl for dessert,much more healthy for me. Rice krispies has come a long way.Never forgotten. fun to make those rice krispie squares to.love the Christmas Rice Krispies cereal because its in different colors. Would love to win this prize. I've really been enjoying rice krispies (with milk) lately. It's a perfect light summer breakfast! J' adore les raisin bran avec ou sans lait à toute heure de la journée. My favourite Kellogg's cereal is mini-wheats or Rice Krispies with milk for breakfast, or evening snack. Frostrd Flakes with almond milk anytime I frrl like it. Mini wheats are our favourite! My favourite is Rice Krispies with milk and strawberries.